Tea has a stimulating effect often attributed to the caffeine it contains, but there is a lot of misinformation about how much caffeine is in tea. There’s an old legend that makes an early link between tea and wakefulness. It features a Buddhist follower who accidentally falls asleep during meditation. In order to stay awake, he cuts off his eyelids and throws them on the ground where they became tea bushes. Waking up to a cup of green tea in the morning is not nearly as brutal, but you can expect a stimulating effect from the caffeine tea contains. However, there are a number of things to consider before you refuse that cup before bedtime. The caffeine in tea depends a lot on growing conditions, production and steeping. Even though all tea is from the same plant, Camellia sinensis, a green tea grown in Australia like Two Rivers will have a different caffeine profile to one grown in Japan or China, simply because of the elevation, soil and climate. Time of harvest and production methods, such as whether the tea producer steams or pan-fries the leaves, plus withering time will also have an effect. Lastly, the quality and temperature of water in which you steep your tea, and the brewing time, will also make a difference on the amount of caffeine in the tea liquor. This mean you’ll get wildly different caffeine measurements from study to study depending on the tea the scientists use and how they brew it. 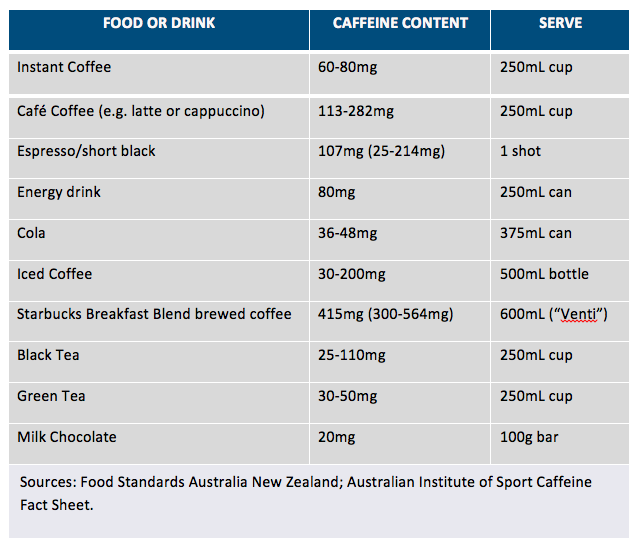 According to the Australian Beverage Council [link: http://australianbeverages.org/for-consumers/caffeine-facts/], a cup (250ml) of green tea contains anywhere from 30 to 50mg of caffeine, while a latte or cappuccino has anywhere from 113-282mg for the same volume. But just measuring the caffeine in green tea is not enough. How it is absorbed will give you an idea of how you can use it for stimulation—or relaxation. Milligram for milligram, the caffeine in tea is different from the caffeine in coffee. Coffee gives you a jolt. Within 20 minutes, the caffeine will begin to remove some of the ‘traffic lights’ in your system, making you more alert. The downside is that once you reach peak stimulation, it drops off pretty quickly, so you crash. has a much gentler ascent due the antioxidants in tea, which slows the absorption of caffeine. You may not reach peak alertness as quickly as you do with coffee but tea will keep you on a plateau of stimulation for longer. Another thing to note is the way caffeine works with L-theanine, an amino acid in tea, which reduces stress. That’s right, you get the alertness from the caffeine while remaining relaxed. This means no caffeine crash. Will green tea keep you awake all night if you have a cuppa before bedtime? Everyone processes caffeine differently so if you’re sensitive to caffeine, a cup before hitting the pillow is probably not a recipe for a good night’s sleep. But if you know where green tea takes you stimulation-wise—with the L-theanine strong enough to help you de-stress but the caffeine mild enough to allow you to sleep—then a cuppa before bedtime might be a good way to relax.